If I had a dime for every time a person asked me this! I’d be retired catching fish somewhere. You get what you put into it. That saying applies to most things in life and your health is no different. After any health issue when you get stable and “feel” better what do most you do? You stop doing whatever it was that got you better and that is where you failed. Whatever actions you took to actually improve that condition must be carried out indefinitely at a lesser pace in order to maintain your results. If you exercised and dieted and lost 20 lbs, build good muscle and increased your endurance what happens if you stop all those activities? In a few months of no exercise, eating too much sugar and bread you gain all the weight back, lose the good muscle and your endurance! Maintenance is a dirty word and we humans don’t like it but unless you want a lifetime of suffering and pain and inability to participate you better do it. Yes if you don’t see a chiropractor regularly you are destined for poor aging and body/mind burnout. 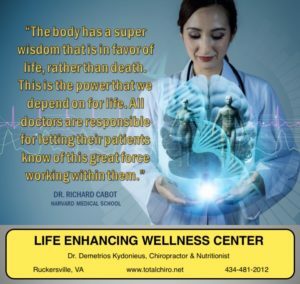 Chiropractic care over a lifetime keeps your body and mind sharp and active until you die. Nothing can do what regular adjusting does. Nothing. The research is out and it proves this. From studies that show chiropractic kids are healthier than medical kids to the studies on senior citizens who get adjusted regularly, they are more active and have less pain than those that don’t use chiropractic. How long before you make it a lifestyle choice. “I don’t have the time”… well your body will make you and then it may be too late. “I don’t have the money”… it will only cost you more the longer you wait. So don’t make excuses, make an appointment with your chiropractor today. Dr. D gets adjusted every two weeks for over 35 years. And even 3 x week when he hurts himself.